Chairman Lee Pal-sung of Woori Financial Group has been nominated by the Chairman Selection Committee for a second term at the helm of the financial group. Chairman Oh Jong-nam of the selection committee announced to media the selection of Chairman Lee for his second term as head of the financial group. The chairman will be officially re-approved at the shareholders meeting in March following the recommendation by the board of directors meeting early the same month. The committee chose Lee for his excellent qualification as top manager of the Woori Financial Group for the past three years in such areas as coordination among group affiliates, communication ability and talent for negotiations with other financial firms, especially in the group’s upcoming privatization, the biggest issue for the group. Lee has been looked upon as the best candidate for pushing the privatization of the group. Oh noted Lee’s achievement in leading the group to overcome the recent financial crisis and record a profit before any of its rival financial groups and for building a global level risk management system for the group. Lee has also been given credit for improving the management structure of the group and began pushing for the privatization of the group, which has been stagnant for the past decade, and turning the group around as one that generates high profits at low costs during his first tenure as top manager, which began in 2008. Reports speculated that the selection committee chose Lee because of his hard work for the privatization of the financial group more so than any other reason. The committee believes that Lee can continue to manage the group and, at the same time, work for its privatization as he has been doing for the past couple of years. Some on the committee wanted to give Lee only a year to serve as chairman because they think he should retire after the group is privatized, strong evidence that his primary responsibility will be the privatization. Last year, Lee worked on putting together a consortium to take over the financial group in order to whip up an atmosphere for the deal, as he strongly believes that privatization would move the group further up the ladder of development. The selection committee has taken into consideration Lee’s passion for getting rid of government stakes in the group as soon as possible. Another task for the chairman during his second term would be resetting Woori Bank’s role as the largest affiliate of the group because there have been many instances of confrontations between the CEO of the bank and the top management of the group, whereas Shinhan and Hana financial groups have had no troubles with the top management of their banking affiliates, Shinhan Bank and Hana Bank. The major reason for conflicts has been the group chairman has had no power in naming the CEO of the bank, unlike the top management of other major financial groups, with Korea Deposit Insurance Corp., a government-run firm, being the largest stakeholder. Woori Bank contributes from 80 to 90 percent of the group’s total annual income. In order to straighten out the problem, Woori Bank’s charter was changed in 2009 to give more power to the group’s top management by transferring the right to call for a meeting of the bank’s administrative committee to the holding company and away from the bank. In addition, the chairman of the group would have more power in naming the next CEO of the bank going forward. Chairman Lee is a career Woori Bank man, having joined Hanil Bank soon after his graduation from Korea University in 1967 and having worked for Woori Bank and its affiliate Woori Securities & Investment for some 40 years. Hanil Bank is the forerunner of Woori Bank. He is the first career Woori Bank man ever to head the Woori Financial Group. In 1996, Lee became the youngest director of Hanil Bank and his achievement in the area of international banking as head of the bank’s international department won the Minister of Finance citation for upgrading the operation of international banking in Korea. In 1999, he was named president of Hanbit Securities, the forerunner of Woori Securities and Investment Co., and he managed the securities firm to generate profits for five years in a row. 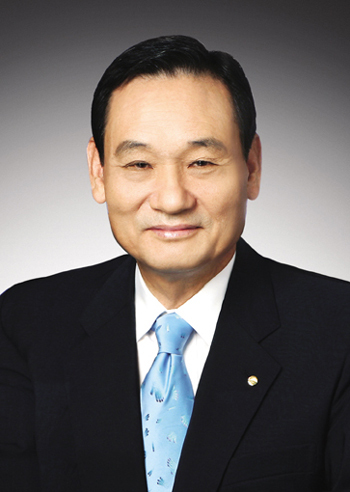 Before he took over as chairman of the financial group in 2008, he headed the Seoul Symphony Orchestra in 2005, a big switch for a financial executive. But he did well, running the music organization like a corporation. His biggest achievement while at the symphony was getting conductor Chung Myung-hun as the permanent conductor for the symphony. Chairman Lee Pal-sung of Woori Financial Group who has been renamed for his second term as chairman.